Climber’s trail started just off Highway 20 due west of Silver Star Mountain’s summit. Good route finding was necessary to get through the initial descent to Early Winters Creek and ascending the steep west slopes through brush and down trees. After the Burgundy Creek crossing, we stayed on south side of the creek to gain the west ridge coming off the mountain’s south buttress. We made it to the 8,000′ col with a col marker and knew we were still on route. From the marker, we followed cairns and descended the east slopes, followed by a rising traverse northeastward aiming for the “complex” gully system mentioned in some reports. Once we were standing below the gullies with the daunting summit block directly overhead, the leftmost gully provided direct access onto the col between Silver Star’s two summits. 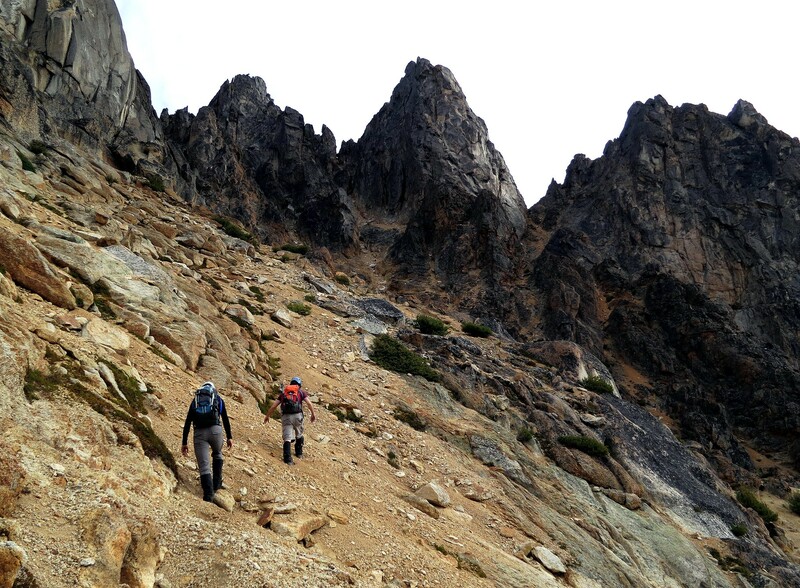 Then we scrambled eastward through choss and boulders to reach the summit.